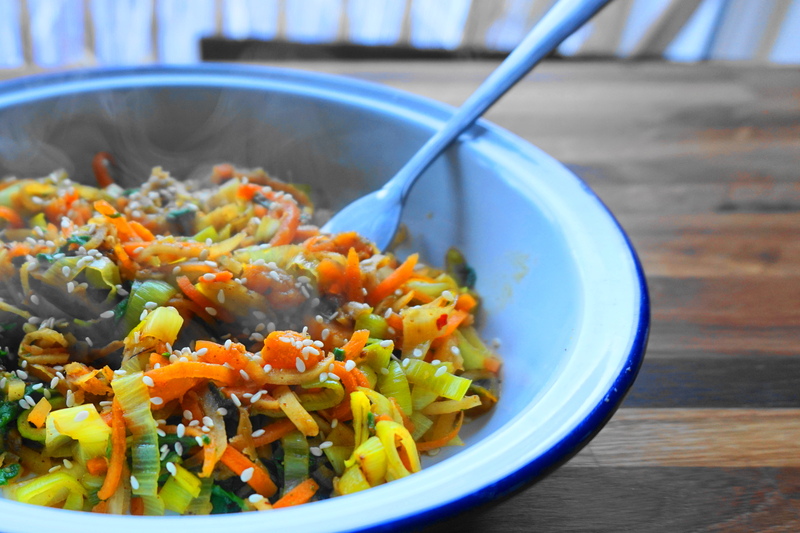 A healthy stir fry full of vitamins, minerals and no carbs! It’s simple and really satisfying – you can taste the health…in a good way. Now, grab your spiralizer and start working on the carrots, parsnips and courgette – these become your carb free noodles! Chops the leeks and pull them apart into strips. Peel and cut the butternut squash into cubes and add to boiling water (leave to boil for 20 minutes) with a dash of salt. Add a teaspoon of coconut oil to a frying pan or wok and chuck in the carrots, leeks, parsnips and courgette under a medium heat – remember to stir occasionally to prevent the veggies sticking. Now, to add taste to the dish we’ll be making a peanutty glaze! Add 1 small cup of water to a pan and stir in the peanut butter – put this on a low heat. Continue to stir until the peanut butter starts to soften into the water. Following this add 2 teaspoons of soy sauce and a dash of chilli flakes (remember to keep stirring and keeping an eye on the veggies) when the sauce starts to bubble slightly, add a teaspoon of honey and continue to stir. The glaze should be quite runny but if you feel it’s a little too thin feel free to add some flour to thicken. The veggies should be cooked, drain the butternut squash and add to the wok. Pour over the glaze and stir making sure all the veggies are coated in the glaze. Add a few more splashes of soy sauce. It’s ready! Put the noodles on your plate and sprinkle over the sesame seeds. A delicious and nutritious plate of food. It’s also an awesome hangover cure!! If you can’t leave without the meat – add some chicken or turkey.